It seems to be a pattern with me that I faff around with a novel for several months, struggling to find my way into it. And then suddenly something will click, and the novel kind of writes itself. The faffing generally involves a lot of pacing around, eating stuff from the fridge, frittering time on the internet, and spending whole days writing stuff that I know in the evening I won’t be keeping. But I haven’t yet found a reliable way of short-circuiting it. The turning point for Daughter of Eden was when I decided to abandon the alternating narrator approach used in the other two Eden books, and have one character tell the whole story, relying on hearsay for events she wasn’t present at. The sole narrator, and main protagonist is Angie Redlantern, who appeared at the beginning of Mother of Eden as Starlight Brooking’s best friend. Daughter of Eden centres on Angie’s own adventures after the departure of Starlight. Once I’d made my mind up to settle down behind Angie’s eyes, the story really started to flow. Angie is a very different kind of protagonist from John Redlantern in Dark Eden, or Starlight in Mother of Eden, and I enjoyed seeing Eden from her perspective. She is a much quieter, more unassuming, gentler figure, her confidence set back by growing up with what people in her part of Eden call a ‘batface’ (i.e. cleft palate/harelip). At the beginning of the book she is living a very humble life: a ‘low person’ , as the Davidfolk call it, right down at the bottom of the pecking order. The big things happen to other people. But suddenly, she finds herself dealing with huge, cataclysmic events: more cataclysmic than anything in the other two books. I enjoyed watching her grow, while human society on Eden turned itself inside out all around her. I am so unbelievably excited. I don’t know what I will do. Be that building time machine or maybe just a cryosleep chamber but I need to transport myself to October right the frak now. Eden is one of the most wonderful sci-fi planets I have ever encountered as a reader. 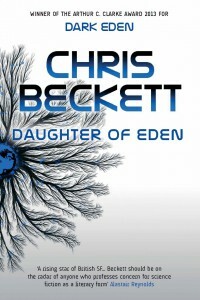 Mr Beckett, this sounds really exciting and I’m looking forward to reading Daughter of Eden. Cataclysmic events? I can’t wait to find out more about those! The two first books contained great great stories and characters. And you’ve got a unique and compelling voice that draws the reader into your superbly crafted world. My wife has also read the books – on my recommendation – and we’ve been discussing them in depth. I’m sorry to say that she has now sided with Tina and Starlight while I remain a loyal follower of Jeff… But don’t worry, we’ll get along anyway. Greetings and a big thanks from cold cold Sweden. Thanks George! Love the idea of building a time machine just to read an SF novel. Thanks Christian. I hope you and your wife enjoy Daughter of Eden, where Starlight’s friend Angie becomes the main protagonist. I like to think it will give you more things to talk about. I’m pleased pleased with it!